In just a few days, The Western States 100 will be open for applications. These applications will be used for the lottery, which establishes the starting field for the 2013 race. * Between November 10th and November 24th, thousands of ultrarunners will complete their applications online. About two weeks later, on December 8th, the lottery will be held live in Auburn, CA. Not everyone can be there in Auburn, so the results are posted live online. In past years, a live video feed provided results as they happened. In June 2010, I crossed the finish line of the Western States 100 in 23:04. My 4 year old son, Jalen, ran with me as I experienced a surreal moment that I had dreamed about for many years. To this day, if I need to draw on a magical uplifting moment in my life, I think back to that illuminated Auburn High School stadium. It was not just because I had just a great race, but the journey of several years before I was finally selected to run in the race. What makes the Western States 100 so special? In part, I think it’s found in the history of the trails. I also think Western States sets the bar for professionalism. It is not just the runners...from the race director and staff to volunteers and crowds, everyone seems to be in agreement that they are all contributing to a very special race. When runners toe the line at the Western States 100, they not only maintain high expectations for themselves, but also for this historic event. In essence, honest respect is felt and projected by everyone...for the race's history, past peformances, the trails, and each other. Most ultrarunners know about the Western States 100. Afterall, it was highlighted in Dean Karnazes’ best selling book, “Ultramarathon Man”. It's also among the most competitive races in the country. Most ultrarunners can recite the history of the race from it's humble beginnings to it's current place in our endurance subculture. While the “WS100” still holds a place among the more difficult mountain ultras, it is not the difficulty of the race that attracts so many of us each year. 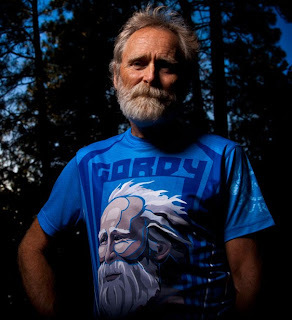 It is the magical experience of running on the same trail that Gordy ran so many years ago. A venue with it’s own memories of monumental performances...where hearts were broken and, for others, the impossible overcome in a feat of individual celebration. In 1974, Gordy Ansleigh lined up for the "Tevis Cup" 100 mile endurance horse race without his horse. Gordy ran the traditional 100 mile horse race on foot from start to finish. He completed the race shortly before the 24 hour cut-off in spite of doubts from others that such a feat was even possible. 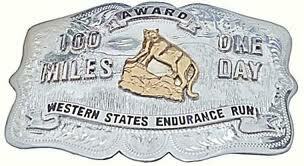 Gordy’s incredible effort gave birth to the tradition of the 100 mile belt buckle, which, to this day, is most commonly awarded to finishers of 100 mile ultramarathons. "I want to thank the rest of you for making me look normal." Over the next 30 years, great champions tested their abilities on the historic Western States trail. One of the best ultrarunners of all time, Ann Trason, blew away the field throughout the 1990s. Scott Jurek then won the race 7 times, establishing himself to be one of the greatest ultrarunners of all time. Gordy Ansleigh didn’t stop in 1974...he continued running Western States 100 year after year, racking up finishes that cemented his name among influential historical figures in our sport. Every participant in the race becomes a part of it’s history, forever contributing to the allurement of this unique 100 mile ultramarathon. This year, I’ll once again be anxiously refreshing my computer and watching the live feed from Auburn, hoping to see my name pop up on the screen. I’ll be joined by many other ultrarunners in locations all over the world. Despite our differences in time zones, nationality, and language...we all have one thing in common... passion for this sport. Good luck to each and every one of you who will be participating in this year's lottery. Let me be the first to congratulate those of you who will succeed in this year's Western States 100 lottery. Next June, as you charge up the first climb, the sun will rise from behind. The sun rises for you.. so cherish the moment.